For visual artists seeking a guided class experience in Italy that is more structured than an independent residency. ICA offers facilities for painting, drawing, printmaking and sculpture, as well as opportunities for uninterrupted studio time in individual spaces. 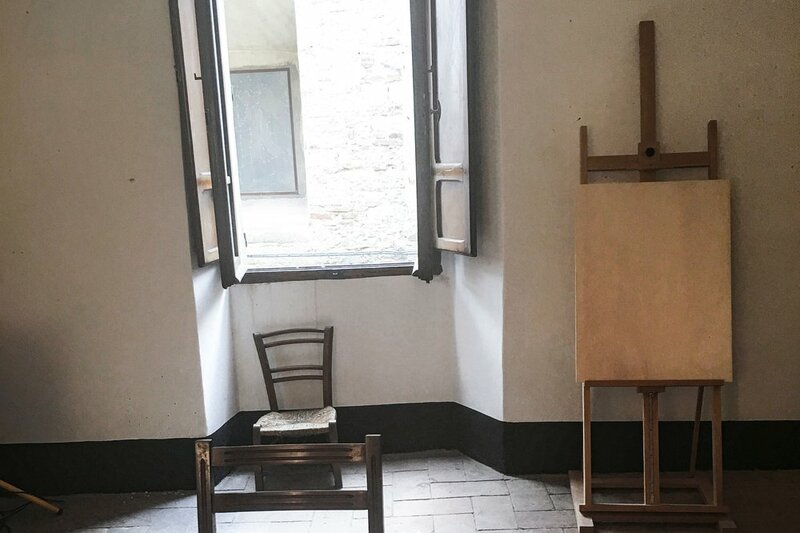 Master Classes with renowned Artist/Faculty combined with a Visiting Artist/Critics series, exhibition opportunities, and weekly trips to some of the most compelling cultural sites of Italy allow for unparalleled artistic growth. Our program provides a spectacular setting for the learning trip of a lifetime. Our program facilitates artistic growth through intensive immersion. Each summer we offer three Master Classes with specific artists as well as ongoing topical workshops and classes in areas ranging from masterwork studies, to figure drawing sessions. Our classes are multi-level, suitable for introductory as well as advanced work. Classes typically occur four days per week; participants may attend as many or as few as they like (however, after the first class, regular attendance is required). Unless otherwise specified, our Studio School classes meet twice per week, for four hours per session. At the International Center for the Arts the International Studio School is the heart of our program. All Studio School programs are three weeks long, however both shorter and longer periods are possible with prior arrangement. Our courses include topical and perceptual approaches, including painting and drawing from traditional subject matter––the figure, landscape, and still life, classes on historical materials and processes of painting and drawing as well as narrative explorations. We offer also offer ongoing figure sculpture and drawing classes in which students work directly from the model. Students in the program who are not necessarily interested in working observationally or in structured classes are welcome to spend time in their studios and are encouraged to sign up for regular studio critique sessions, in which participants meet weekly with a visiting critique. These students may also attend workshops, but are free to develop individual directions in their work. Our teaching Faculty and Visiting Artists are known for making work that intimately connects to the Italian experience in some respect. Drawn from top institutions around the world, our Faculty and Visiting Critics are artists recognized for their achievement in their respective mediums. Join one of our upcoming retreats, build your trip from one of our sample itineraries created from our years of programming experience, or work with us to develop your own retreat from the ground up. The first step is to contact us with the type of retreat you’d like to take and we’ll work from there! At the International Studio School we believe that the value of studying art in Italy is not easily defined by any single approach or aesthetic. Surrounded by great masterworks of Western art, our minds are opened to new directions of conceptual growth, to more expansive avenues of communication, and to more creative and sophisticated ways of using materials. This could be said to be the fundamental value in studying the “classics,” yet Italian art also challenges conventional notions of what “classic” art has come to mean. Far from the reserved stoicism that we often associate with the word, Italian art is often funny, whimsical, irreverent, inventive, and almost always, passionate. Thus, perhaps the experience of studying in Italy is as varied as Italian art itself. At the Studio School, we take art seriously, but like our Italian models we also value inventiveness, individual innovation and commitment to self-expression. With this in mind, we do not promote a particular ideology, follow a particular approach, or stress a certain technique. Instead, we stress growth in understanding the rich language of visual art, in learning to see, and in learning through example to use our materials as carriers of meaning rather than as a means to an end. We believe in guided discovery, in learning through dialogue, and in seeing great art as a living expression of real humans, like ourselves, from whom we can learn and grow. We engage in discussions on works of art as a community, striving to create an environment in which we exchange ideas and grow as artists together. The International Studio School at the International Center for the Arts at Monte Castello offers intensive studio programs for students from around the world. Our faculty of distinguished internationally recognized artists teach regularly scheduled classes and critique the work of program participants in their studio spaces as well as in optional end of the session reviews held in our gallery. Visiting artists and scholars lecture on various topics including their own work, the history of Italian Art, and contemporary art. 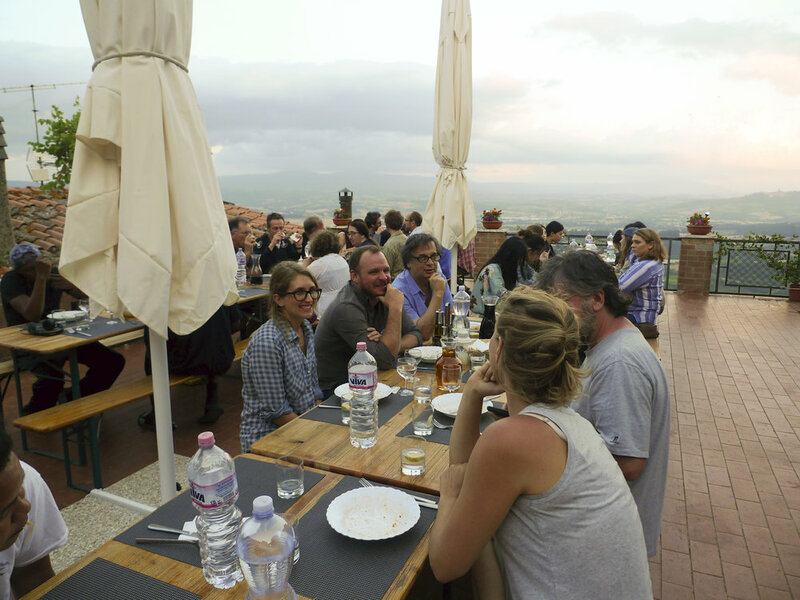 Program participants, residents, faculty, and visiting artists all live, dine, and work together and in the ancient, walled city of Monte Castello di Vibio, a hill town in Umbria, one of Italy’s most beautiful regions. In this timeless environment participants find an equilibrium between the old and the new; a balance between solitude and community in which focused, intensive work and dynamic interactions between students and faculty leads to greater proficiency and enhances creativity. One of our most important activities at the International Studio School is looking at and experiencing great art. We make the history of Italian art fully accessible to our students, using our central location in Italy to our advantage in making regular field trips to museums, churches and cities with some of the richest collections of visual art in the world. Italy is rich in masterworks; many of them still in the sites for which they were painted or sculpted. This gives us the advantage seeing them in relation to architecture, to the landscape and to other works of art. We find that deeper layers of meaning emerge when one experiences the full physical presence of works of art. Original sites make this more accessible than a museum setting, although Central Italy has its share of great museums as well. On our field trips, faculty and students discuss works, consider their meaning, learn how they functioned, examine how they affect us today, and examine how they were made. Together, we draw in sketchbooks directly from works of art, analyzing forms and structures while also internalizing the essence of works that have continued to resonate through the centuries. On the evening prior to each trip, we have an overview of the location we will visit, discuss its highlights, provide information on schedules and even work with students on designing individual itineraries to see the sites most important to them. At the International Studio School the common focus of our diverse activities is drawing and painting. We believe that drawing is the common language of visual art, translating perceptual experience into a rich and complex primordial language that exists without words, outside the specifics of culture and time. Likewise, painting communicates directly, transforming experience into substance on an elemental level. Our location in Italy provides rich evidence supporting these attitudes and positions, surrounded by timeless works of art that seem as relevant and as accessible today as when they were mad . Together, we explore these mediums with individuals who have devoted their lives to exploring their subtleties. Well known both as professional artists as respected teachers, our faculty in painting and drawing come from some of the top art schools, colleges, and universities in the world to teach classes in landscape, still life, figurative traditions, materials and processes. Perceptual as well as more synthetic approaches are used in their classes, with occasional offerings in other media being offered in classes as well. As a student you will also be able to meet with faculty and visiting artists in your studio to explore personal directions in your work. We welcome students of all levels of proficiency, ranging from experienced artists to undergraduate students to beginners of all ages. At the International Studio School we have an exceptionally well-developed focus on historical materials and processes of painting and drawing. Many of our faculty members are acknowledged experts on particular materials, processes or techniques of specific artists or schools of painting. In our classes, we begin from the ground up – literally. We offer topical courses on fresco, egg tempera, and various schools of oil painting in addition to integrating sensitivity to materials into all our classes. Often making materials we use for various processes from raw ingredients, our students develop a hands-on understanding of making paints, mediums, even many pigments––all prepared according to historical processes. Our location allows us to enrich our understanding of processes with a kind of immediacy not possible in many places. 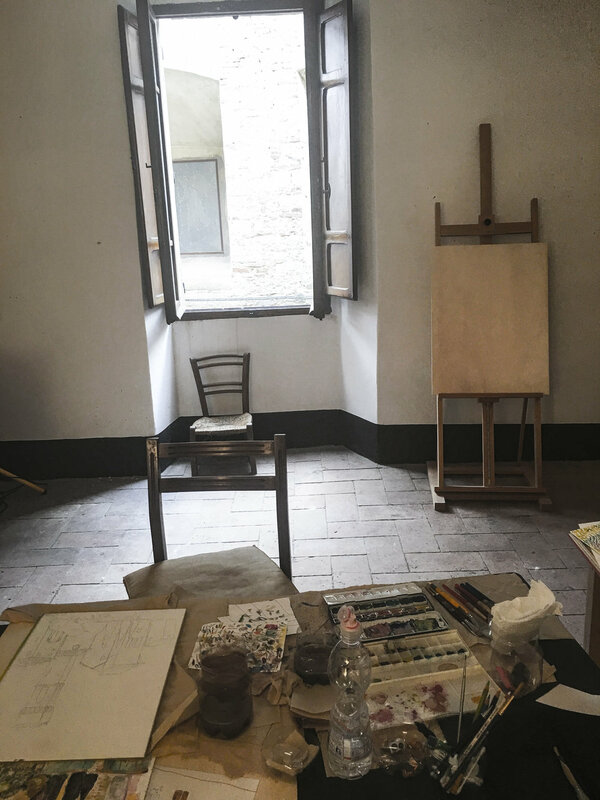 Our students have the rare opportunity to not just to see frescos, tempera paintings and oil paintings of great technical innovators such as Titian or Caravaggio, but also to explore their methods in classes and in studios under the direction of experts in these areas. We also make field trips to sites where we can harvest materials directly from natural sources such as Verona green earth, raw Siena from the town that gave its name to that color and red ochre from around Naples or to visit historic manufacturers, such as the historic paper mill that still produces Fabriano paper. For more information, visit our accommodations page. Program participants will have a wonderful introduction to traditional Umbrian cuisine, with meals prepared in an on-site kitchen, from the freshest ingredients––after all, Umbria is called “the green heart of Italy”! Except for field trip days, program participants will enjoy three generous meals every day, all lovingly prepared by our cook. Daytime meals are served in our common space, where students, faculty and residents interact over stimulating mealtime discussions, while dinner is served on an outdoor terrace overlooking the beautiful Tiber valley. All program participants in the visual arts are provided with private or semi-private studio space in the medieval buildings around the village. Typically, we are able to accommodate individual artists’ needs with size and location of studio spaces. Through our application form, we determine your needs taking into consideration factors such as natural or artificial light, wall or table space, or even if you prefer a space with a view or one of our cooler, more atmospheric interior spaces, which themselves often become the subjects of works of art. All classroom spaces and studios will be equipped with easels, tables, and drawing boards. We have an extensive digital library for student and faculty and projection equipment is available for faculty use according to your needs. If you are coming with a group, we can dedicate a classroom space for the appropriate times and days of your class meetings. High speed internet, wi-fi and computer use is available in the commons room. Each week of the program, an excursion is scheduled to extraordinary destinations around Umbria and Tuscany. In the course of a three-week visit, scheduled trips always include Rome and Florence. Other destinations are scheduled in advance to cities such as Siena, Arezzo, Orvieto, and Assisi. See Calendar for this year’s schedule of field trips. We also offer additional, topical guided trips upon request for an additional fee. Generally, three classes will be offered per week, each class meeting either on two half-days (morning or afternoon) or for one full day depending on the course content. Typically, we will also have two to three visiting artists and/or critics per three-week session who will present lectures on their work after dinner at the beautiful Teatro Concordia in the center of the village. One or more of our visiting artists/critics will be available to visit students in their studios in each three-week session. Visits with critics are scheduled by the student on an elective basis. All faculty will present lectures on their work and influences at the Teatro Concordia or in the Commons Room. These usually occur in the evenings after dinner followed by a reception in the piazza after the talk. See our Calendar for upcoming schedule. Students electing to do so will have the opportunity to participate in a public critique at the end of their session, scheduled the day after the Student Exhibition. The critiques will involve the full faculty and any students wishing to participate. Those participating are kindly requested to remain through the whole critique, offering constructive input to their fellow participants in the program. Our group critiques are always conducted in a constructive, collegial manner, geared to build on individual strengths and suggest directions for individual growth. At the close of the session, students have the option of participating in a group exhibition of work produced in the course of their visit. Exhibitions are held in the school gallery, which is centrally located in the village, near the theatre. These events are well attended by the community as well as by artists residing in the area, and present students with an opportunity to participate in a public exhibition in Europe attended by an exceptionally well-informed audience. Sale of work is permitted and encouraged.